A competition that awards grants to worthy student-led charity projects gives young Russians the knowledge that they can really change their communities - and maybe even their country. Anton Pashkevich of Novosibirsk State Technological University (NSTU) is troubled that Russian schoolchildren don’t want to work towards engineering degrees. “The majority of my former classmates study economics or law. Meanwhile, available research shows that Russia will soon need engineers rather than people with an education in the humanities,” he said. Pashkevich is not the only one concerned. President Dmitry Medvedev has repeatedly pointed to the urgent need to make engineering a more prestigious profession. 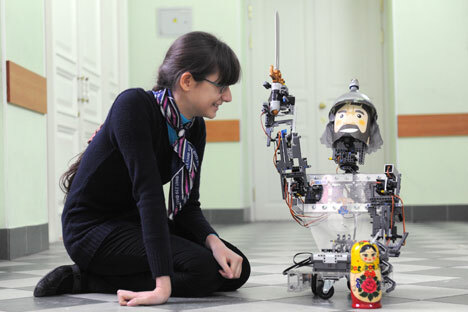 Pashkevich suggests that robots be used to “entice” schoolchildren into studying at institutes of technology. The League of Robots team wants to buy several Lego kits to assemble transformer robots, recruit several teams from local schools, and stage something like a battle of robots between the teams. Those wanting to continue studying robots will be invited to join a robotics group specifically created at NSTU. Incidentally, NSTU students have already held a roundtable discussion with schoolchildren, where they discovered that more than 60 percent are interested in robots but know little about them and often do not even realize that robots have long been part of everyday life. This means that the only reason engineering is unpopular among school kids is that they just don’t know what modern-day engineers do. Many of those engaged in the battle of robots will presumably become their creators in the future. Girls from Vladivostok, meanwhile, want to build a special touch-sensitive garden for children with poor eyesight. There is a daycare center for such toddlers in their city, but it lacks a playground. Playgrounds for visually impaired kids are available, though: They are made up of flowerbeds with various plants or alleys with different surfaces. There are only two such playgrounds in Russia. If the girls bring theirs to life, the third such playground will soon appear in the Russian Far East. These are just two of 50 projects envisioned by volunteers from a summer school sponsored by Vladimir Potanin’s Fund; a similar program has been around since 2008. Prior to that, the Fund had engaged solely in handing out scholarships, selecting several dozen winners from each of Russia’s 60 best public universities. As Irina Ostarkova, deputy director of the Fund, puts it, one day it dawned upon them all that it was not enough to award scholarships to straight-A students –kids should also be encouraged to be more socially active. And then the students themselves came up with the idea for volunteer projects. The organizers were surprised at the number of volunteers – every time they receive more than 100 requests, and the best are awarded grants. The volunteer movement in Russia is still in its early stages, but this does not mean there is no one eager to selflessly help those in need. Last year’s forest fires showed that many people are willing to lend a helping hand in a time of need. It was largely thanks to volunteer efforts that the fast-spreading fires were extinguished, yet many people wanting to volunteer simply do not know where to go, due to a lack of available information. Meanwhile, young people seem to be coming up with many exciting ideas of how to change life for the better – they need only to be given a nudge. Students from Tver University increased the number of blood donors in their city. Before their project, there were only six donors per 1,000 residents (an good target is 25-30 donors). “It turned out that most students did not know anything about giving blood. What is more, they were misled by numerous myths of how dangerous and risky being a donor might be. We lectured at auditoriums on the importance of blood donation, opened a blood-donation site at our university, and were the first to donate blood,” said Yulia Saranova, a participant in the first volunteer program launched by the Potanin Fund. Now, two blood donor days a year are organized in Tver.